One of the biggest music comebacks ever has been the vinyl record. Unfortunately, a traditional turntable setup requires additional outboard equipment and a bunch of unsightly cords that take up a lot of space. The Floating Record Vertical Turntable by Gramovox, a Chicago-based startup, solves this problem. 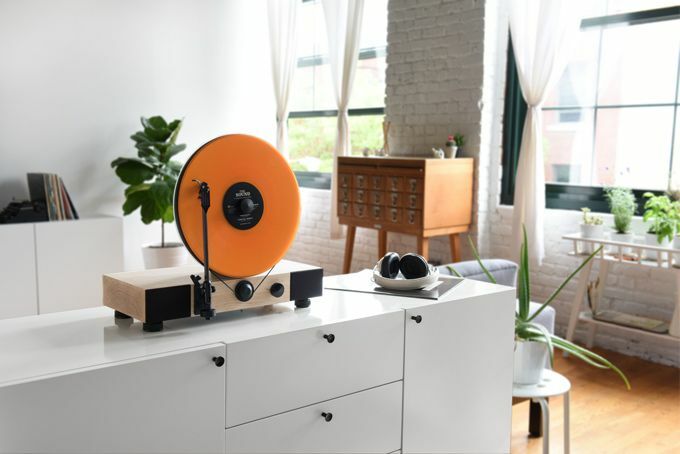 It's a space saving plug and play turntable that spins music for your ears and eyes. It takes up roughly half the space of a horizontal player, produces high-quality stereo sound, and when it spins it’s mesmerizing to watch. We share more photos and details on the following pages. Psst, do you need to create space for your record collection? Check out this platform bed that has built-in compartments for vinyl. How Does this Floating Record Turntable Work? The Floating Record Vertical Turntable by Gramovox is virtually taking the way we spin vinyl into a new direction. Sure, before the dawn of the digital music age there were a few highfalutin stereo systems on the market that played vinyl straight up. But they weren't nearly as compact or good-looking. The Gramovox eliminates the clutter electronic equipment creates since everything you need to start spinning is built into the turntable. However, persnickety audio-files do have the option of plugging in their own gear like preamps and speakers. While you won't be able to play your great granny's 78 RPM records, you will be able to spin 33 1/3 and 45 RPM vinyl formats. So how does this space saving turntable defy gravity? All of the components are perfectly balanced to operate in the vertical position. The player also relays on a belt drive system and a high-quality motor that helps the player achieve a smooth consistent playback. We also appreciate that each turntable comes equipped with a Audio Technica AT95E cartridge (that's the thingy that houses the needle.) It produces a warm rich sound that's just as beautiful as the premium walnut and maple woods used to build each player. Gramovox is currently seeking funding via Kickstarter. So far the project has raised over $700,000 — not bad since their pledge goal was only $50,000. For a $349 pledge, you can receive a floating record player with either a dark walnut or light maple base (regular retail price is $449.) You will receive your order by December 2015. For more details or to pledge visit Kickstarter. Do you want to submit a small space story? We welcome submissions from readers, architects, designers and pretty much anyone else who would like to see their small space published on Small Spaces. To reach out, send us a message via our Facebook page. Could You Live in a Converted Shipping Container?